Gary Bettman and Donald Fehr, respectively. A league in turmoil has reached some sort of calming agreement. After roughly 10 months of no progress, the National Hockey League and the National Hockey League Players’ Association seem to have some to some agreement on how to move forward and have agreed to a tentative labor deal stretching out for the next 8 years. The NHL lockout of 2012-12 is finally over. Now, the race is on to get a training camp in place, get players onto the ice, and fill the stands with fans once again. If this seems like deja vu, the league just had a lockout that killed the 2004-05 season. The lockout ended after a total of 113 days with no NHL games. A total of 480 games of the season were called off, but the league could salvage up to 50 games and begin playing within 10 days if all goes well on those I-dotting and T-crossing missions. 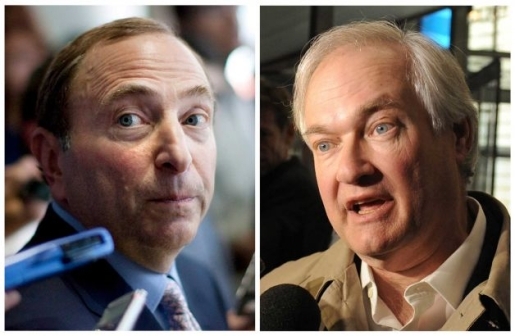 The league’s 30 owners and 740 players still need to ratify the agreement hammered out by NHL commissioner Gary Bettman and NHLPA chief Donald Fehr.